I purchased M.C. Planck's science fiction debut novel, The Kassa Gambit when it first released. I picked up the 288 page-long hard cover edition of this rather short space opera because the premise looked interesting. It is a quick read, but I found it to be superficially developed without enough details to make it stand out in any way. 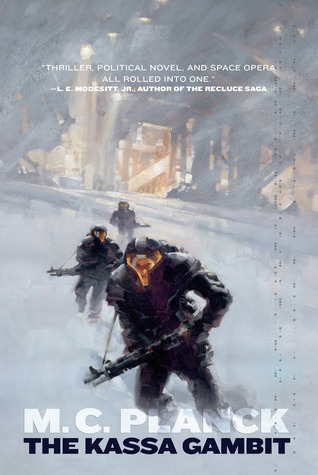 The sci-fi world-building is rather generic with action that lacks real excitement, and while the characters did not draw me into the story, to a certain extent, the plot did. The Kassa Gambit is your basic mystery set in space with the two main characters separately, and together, fighting their way to find the answers. I love mysteries, so of course once I began reading, I wanted to know the final resolution. Captain Prudence Falling and the small crew of the small tramp freighter Ulysses answer a distress call from the small planet of Kassa and inexplicably find it to have been decimated by a full-blown attack. Right behind the Ulysses is a ship from Altair Prime's Fleet and with them comes police office Lt. Kyle Daspar of Altair Prime, an anti-League double agent working undercover, sent there on an unexplained mission. While aiding survivors, Kyle, Prudence and her crew discover a crashed, abandoned "alien" spaceship. This discovery means that humans are not alone in the universe and everything will change. Kyle comes to the conclusion that an unknown someone from the League sent him to Kassa for foul purposes. Hoping that his undercover anti-League role is not blown, he denies knowledge of the find and carefully arranges for another Fleet Captain to conveniently make the discovery. Meanwhile, as Prudence and her crew leave Kassa and run to safety, she spreads bits of news throughout the ports implying that the planet has been brutally bombed and devastated by aliens. The news quickly makes the rounds around the scattered planets as Kyle barely survives a brutal attack. Soon Prudence and Kyle find themselves on the run together trying to figure out who is really behind the attack on Kassa and what the ultimate ramifications may mean to the human race. The Kassa Gambit is categorized as a space opera, so the first thing I looked for were the science fiction details and world-building. The science fiction information provided such as the superficial touches on sociological, cultural, and political structures, and the more detailed explanations of space travel with spaceships using the gravitational pull of planets to accelerate and decelerate and jumping through actives "nodes," turned out to be good, but predictable. The action is also there with a few space battles and the threat of lurking danger, it's just not exciting action. Additionally, as expected, this is not a character-driven story. Instead, the central characters serve as the key narrators whose roles are to drive the plot forward by providing details and action. These characters, however, need to be engaging to keep the reader interested and invested enough to care about what happens to them. It is unfortunate then that I never came to care for Captain Prudence Falling. Prudence is a cold, paranoid, self-centered character who doesn't change by the end of the story -- even when we are told she does, I didn't quite believe in her. Her paranoia boosts her skills as a Captain and gives her good insight. However, there are mixed signals given about this character -- telling and not showing. For example, in my opinion, Prudence's attitude toward her crew says a lot about her. Despite attempts to keep her distance, Pru has supposedly found a "family" with her crew, and is particularly attached to simple-minded Jor whom she mothers. But, there is a disconnect there because one minute she's protective of him and the next she's using or willing to sacrifice Jor to save herself. Kyle's personality traits match Pru's in that he is cold, calculating and paranoid. He is also willing to sacrifice others, but in his case it is so that he may complete his mission to keep his home planet, Altair Prime, safe. A man with a purpose and nothing to lose, Kyle is dangerous but I also found him to possess warmth and a conscience. Unfortunately, his paranoia is so extreme at this point that at times throughout the story, his way of processing information and working through possible political and personal ramifications become a confusing, frustrating mess. The "romantic" touch in this space opera is awkward with Kyle and Prudence developing an almost instant, and not entirely understandable, attachment for each other. The thing is that the premise for the mystery plot in The Kassa Gambit worked well enough to keep me reading. And I believe that although this book is lacking in those small details that make a space opera shine, if I had thought of it as entertaining, light science fiction, it may have worked for me. I particularly liked a few of the secondary characters that provide Prudence and Kyle with information while they jump from planet to planet, the fast paced evolution of the story, and the twisty revelations and resolutions Planck uses in the end.